First and foremost, I want to wish my little sister a very happy birthday! May all your dreams and wishes come true! Love you, Aek! From the looks of my recent posts, one would be inclined to think that I don’t cook anymore. I haven’t posted a recipe in a really long time! In my defense, 99.9% of the meals I’ve made in the past few months have been measurement free. A little bit of this and a little bit of that. And only afterwards do I think, “Oh, this meal was blog-worthy.” Oops! I’m turning into my mom! Anyway, I’ve been trying to think of different ways to use tofu, as we are getting a little bored with the bake/grill method. When I saw a box of jumbo pasta shells in our pantry, I knew exactly what I wanted to make – spicy tofu ricotta stuffed shells. 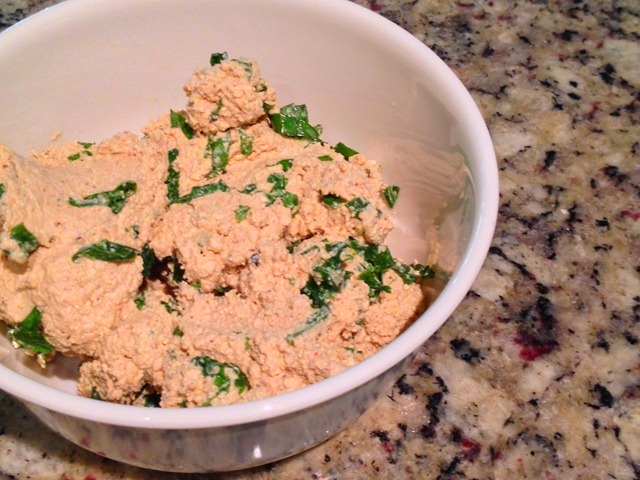 I’ve made tofu ricotta once before and was pleasantly surprised at how much I liked it. However, I couldn’t remember the recipe I used, so I went back to the internet for some inspiration. After looking through a few different recipes, I picked one I liked and got to work, tweaking things as I went. And this time I took notes! The end result was delicious – a creamy, spicy and slightly tangy mixture that tasted amazing with the pasta and sauce. And the basil added a ton of fresh flavor as well. Personally, I think this would take the place of ricotta in a lot of dishes, including lasagna, sandwiches, pizza, etc. And while it does not taste exactly like ricotta cheese, it does resemble it in many ways, namely the texture. Don’t believe me – try it out for yourself! In a food processor, combine all ingredients except for basil and pulse until combined. Transfer mixture to a medium bowl and fold in basil. ***If you don’t own a tofu press, feel free to make your own like me! After draining the block of tofu, I wrap it in a bunch (~10) paper towels. 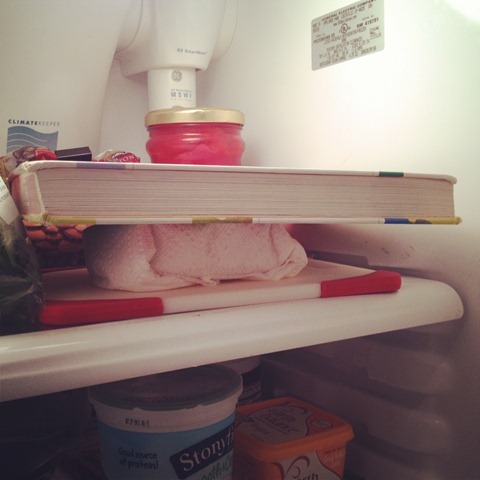 Next, I place my wrapped block of tofu on a plate or cutting board and top it with a heavy book. And I keep it in the fridge until it’s ready to be used. Voila – a homemade tofu press! Have you ever tried tofu ricotta? What’s your favorite “fake” food? I love tempeh bacon! I’ve heard that tofu ricotta is good, but I haven’t tried it yet! I think my boyfriend would enjoy this, too! YUM! I’ve never tried tofu ricotta but anything smothered in marinara sauce is always a keeper! My favorite “fake” food is probably vegetarian sausages. As much as i love meat, the ingredients in some of the regular sausages are scary! Happy Birthday to your sister!!! I love using tofu to make cheese – I was just thinking I need to make a eggplant rollatini again. I swear you wouldn’t know it’s tofu! i have not tried tofu ricotta but made paneer using similar technique before. I love tofu so this will be really good I think. Happy Birthday to your Sister. 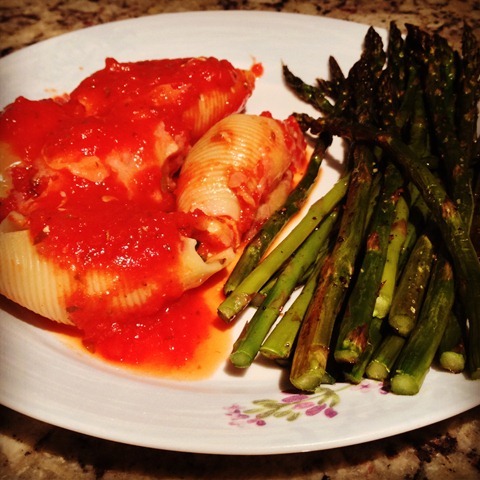 I love anything stuffed in pasta shells, I think they are my one weakness. We have a restaurant here in SF that stuffs theirs with spinach and mushrooms I always end up ordering it because I would regret it if I didn’t. Never tried tofu ricotta, but I will now. If it’s smothered with sauce and cheese, it’ll be hard to decipher what’s in the ricotta. Looks delicious!